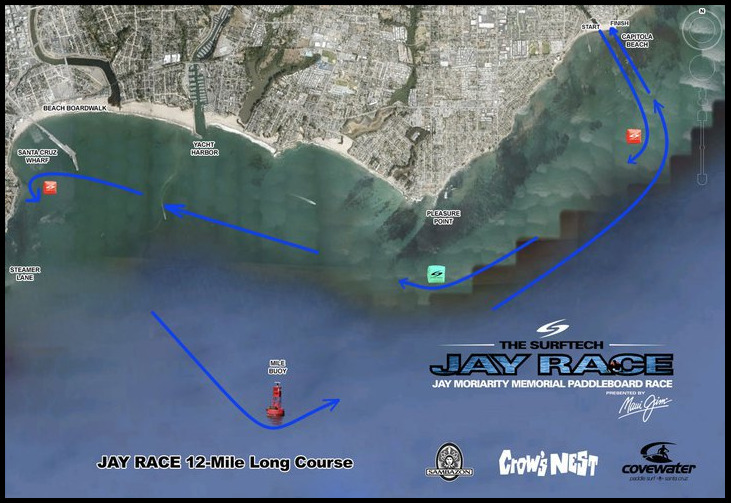 Well, I’ve got some time to tell you about my little 12 mile adventure this past weekend at the 10th Annual Jay Moriarty event in Capitola. You know me, I'm a surfer and not a racer at all. I only race when there's no surf. Sam, in the rest area with his board. I’m always looking for an excuse to get out on the water; be it surfing, fishing, or paddling, I’m game. Last year, I did the 2 miler and was planning on doing it again because it was such a fun event. Little did I know that I was going to be ragged on by all my friends about not doing the 12 mile race. I got it the worse from my fiancée though. Who would of thought? So I made the commitment and registered for the 12 mile event a couple of weeks before the event. 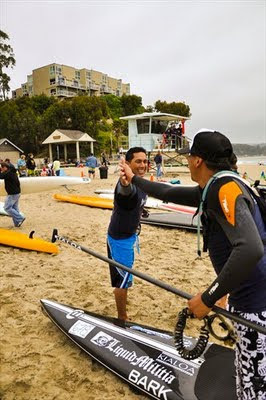 I’ve been preparing for the event by paddling with my Santa Cruz paddle buddies and my best friend Dana. We paddle in the open ocean on the weekends, and in the canals by my house during the week. I’m also tracking a south swell that hit Hawaii days before the Jay race (It takes about 2 days for a south hitting Hawaii to reach us). All my friends back home are telling me that I’m missing it and it’s probably the best south swell to hit Hawaii in a long time. Of course, with that swell in the water, I’m getting a little antsy. I really want to surf and in the back of my head, I’m thinking about bailing on the race. I watch the rest of the week for the swell to come in. I finally gave it a rest the Friday night of the race because nothing was showing up on the buoys. That’s it, I’m in for sure now. I get up early and get ready to head down to Capitola. Parking is scarce and expensive. I wanted to get a space as close to the event site as possible. I roll into the parking lot in the dark and I hear waves crashing. Being the prepared guy that I am. I also packed my surf SUP in the rig I run out and check if there is any wave action worth suiting up for. Yep, there it was. The south swell I’d been waiting for with head high set waves. Once again, I start thinking about bailing on the race and surfing all day. My friends roll into the parking lot and say let’s surf before the race. I was like race you to the beach! So, I’m standing there in the lineup and having a blast surfing. My buddies Andy and Dana say we should go in and rest up for the race. So, we all turn around and go in. While taking off my wetsuit, I’m thinking again: I’m definitely going to bail this event and go surf my brains out somewhere else. Sam, off to race the 12 miler. Right then, all my paddle friends from Southern California (Matt Becker, John Becker, Aunty Martha, Joe and Jack Bark, and John Goodman) show up and egg me on into doing the race. I’m thinking again…12 miles of pain and torture, or fun in the sun surfing all day! Of course I fell into peer pressure and reluctantly got ready for the 12 mile run up and down the coast. The racers are all getting ready in the start area. Some of them are really getting psyched on the sand just before they paddle into position near the starting buoy. I’m just there thinking to myself I just want to finish. This year they started us in the water because of the south swell in the water that was creating a nice shore pound that could cause some issues. So I paddle into position at the starting line and start relaxing getting my head ready for the long haul. The horn blows and all the competitors take off. I start paddling and trying to keep a steady pace so I can make it to the end. I aim for the first buoy a mile offshore. I see all the top guys getting there quick and making the right hand turn to the next buoy at Pleasure Point. I’m chugging along with one thought in my head: Didn’t I tell Shawn that I wasn’t going to do something like this again at the Santa Barbara 9 mile race? I hit that buoy and now aim straight for the Pleasure Point buoy. I look ahead and see the pack starting to string out. I have my iPod blasting tunes in my head and I keep a nice rhythm. I start to tell myself that the buoy isn’t that far away and I can get there. I make it to the Pleasure Point buoy and start my way to the Steamer Lane buoy. I’m chugging along looking at the buoy about 3 miles away and saying it’s not that far and I can make it there. I’m already getting tired and thirsty. I pop a GU and drink water from my camel back to keep me from feeling too tired. I come across a paddler sitting on his board. I stop and ask him if he’s all right. I introduced myself and he did the same. His name was Chris and he did this 12 miler last year. This year he had his son join in the fun. He was waiting for his son to catch up. So, I sat there and kept him company till his son made it to us. As soon as his son caught up to us, I got back on my board and paddled toward the Steamer Lane buoy. Once I rounded that Steamer Lane buoy I took aim at the 1 mile buoy (it’s actually about 1 mile off the Santa Cruz board walk. Which is half a mile long!). The water in the stretch was jumpy and made balancing on my board challenging. To top it off while paddling out to the 1 mile buoy I see what looks like a baby shark breaching the water and catching full body air like on Discovery Channel! I almost took a crap in my shorts! I’m telling myself to relax and DON’T fall in this area and hurry to the mile buoy! I hit that mile buoy and it was a huge relief to get there. I take that thing on my left shoulder and point straight towards Rio Grande drive in the mountains, that’s my landmark to get me back to Capitola. Now the fun part of the race begins because the wind is now at my back and I can catch some bumps and rest for a little while. I pop another GU and drink water. 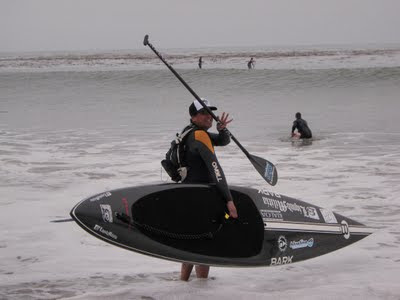 Then I start paddling with a little quicker pace to keep me gliding along with the wind and waves. I see in the Pleasure Point buoy in the distance and, again, I say to myself that it’s not that far. As I’m paddling downwind I see other paddlers in the water that were ahead of me the whole race and I’m catching up to them! I’m feeling all stoked in my head. I never thought that I would actually catch people. During this leg I was just having a blast. I was catching people and eventually passing them! 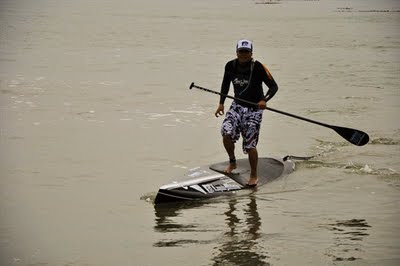 Dude, I got super psyched and started to pick up my paddle cadence. 12 miles is a long way! That feeling of fun and games all came to an abrupt end as soon as I rounded Pleasure Pont. As soon as I hit that corner the point blocked the wind at my back and I was back to paddling to make it to the finish again. I set that feeling aside and start to look for the last buoy to round in front of Capitola. I see it in the distance and tell myself again, that’s not too far. I can get there. By this time I’m really tired and have been bucked off my board about 4 times into the ocean. Falling off, then climbing back on the board, and getting it moving again takes a lot out of me. I’m getting closer to the Capitola buoy and pass a couple more people. I hit that final buoy and point myself to the finish line. Now that I’m headed to the finish line, I know that all my friends already finished and are having beers (You know what I mean Ryan bud). I start to look at the finish line and for the first time during this whole adventure I say to myself: Man that’s a long way to go! I try to shake that thought out of my head as fast as I can. More importantly, I start to think about the beers at the end. I start paddling with a quicker cadence again. The finish line is getting closer and closer with every stroke I take. I’m getting closer to my goal of just finishing this gnarly 12 mile adventure. Then I stop- I totally forgot about the swell that’s in the water! I see the shore break pounding the beach from the back of the waves. There’s no way I was going to get pounded and get my board all busted up from the cobble stones on the sand. So I pause and time the sets to make my escape to shore. Hopefully it would be a clean escape, and it was! High Five? Dude, get me beer! My friends are on the shore cheering me on. 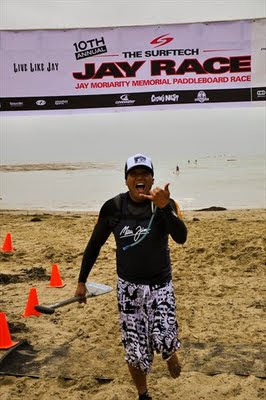 Andy grabs my board and I run to the finish line and cross it in 3 hours and 4 minutes! That time includes waiting with Chris for his son to catch up earlier. I’m stoked! Everyone gives me high fives and congratulates me for finishing. Of course I’m really tired, but not tired enough to stop looking for the beer that I’d earned. 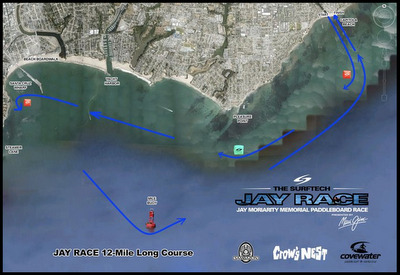 Well that’s my little 10th annual Jay Moriarty paddle race adventure for 2011. I’m looking forward to doing it all again next year! 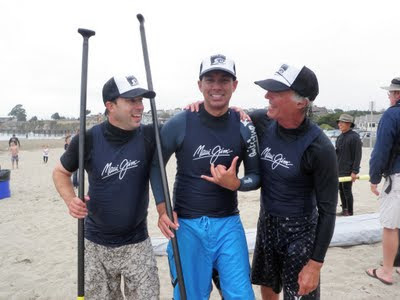 Thanks to my regular paddling and surfing buddies (Dana, Andy, and Gary) for always being there bros! Thanks Kyla, Ryan, Shawn, and Pablo for always supporting me! I am Liquid Militia 4 Life! 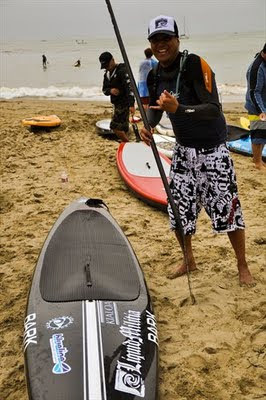 Thanks also to Blueline/Paddle Surf Hawaii (Jim Brewer, Blane, and Austin) for my killer surf SUP’s, Isurus Wetsuits (Jim Brateris) for making some really great wetsuits that keep this token Hawaiian dry and warm, Kialoa (Dave and Meg Chen, Pam, and Lisa) for the awesome paddles and that Toro worked really well for me, and Joe Bark for making me an awesome race board! And... The guys Dana, Andy, and Andy's wife Nancy who took 3rd in the relay event! Congrats to them! Future Fins Factory Tour... Check it out!